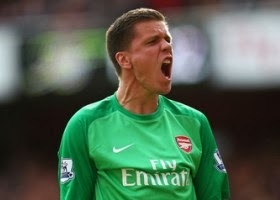 Wojciech Szczesny believes that Arsenal perfectly placed for a title tilt. Recent run of form suggest that Arsene Wenger’s side look well equipped to end their Premier League nightmare. Szczesny, who kept a fifth clean sheet of the season for victory at Cardiff City, said: “We’re in a position that we’d like to be in for as long as possible. But it really doesn’t matter where we are now. “It matters where we are in May and if we carry on like we are now, then I’m certain we’ll be top in May. “We have a lot of work to do and a lot of tough games to win. “But there’s no point in putting pressure on ourselves. We just want to enjoy every single game. “We knew that because Man United and Man City had both dropped points here, it would send a very strong message to our rivals if we won.